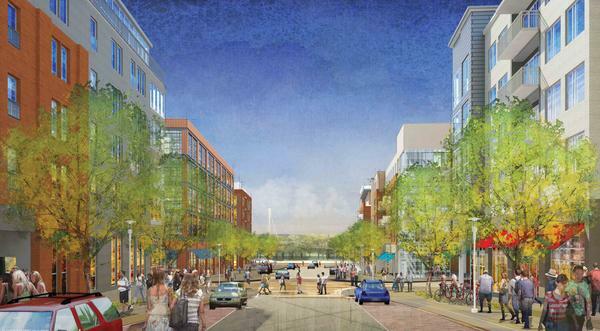 Crawford Hoying Development Partners is unveiling plans to invest up to $300 million in a mixed-use project that would transform 25 acres along Riverside Drive in Dublin, and provide a key building block to the city’s Bridge Street Corridor effort. The proposed Bridge Park project on the east side of the Scioto River calls for 1,026 apartments, 136 condominiums, 140,000 square feet of commercial office space, and a 196-room hotel with an attached conference center that can host up to 800. The Dublin-based developer also expects to attract a 19,000-square-foot specialty grocer, nearly 31,000 square feet of additional retail, and numerous restaurants that will fill 40,000 additional square feet of commercial space. Crawford Hoying Principal Brent Crawford told me pent-up demand from young professionals working in the nearby Wendy’s Co. and Cardinal Health Inc. office campuses, plus empty-nester older adults seeking to downsize their Dublin residences, should provide initial demand for some first-phase residential projects. “We’ll be able to keep a lot of those people in Dublin,” he said. “Our goal is to break ground in September and build out the project in three to four years,” Crawford said. The mixed-use project with several separate buildings will allow the developer to build in multiple phases as demand allows, especially as it relates to the multifamily residential component, he said. Crawford Hoying in early June bought the Bridge Pointe shopping center at Riverside and Route 161 for $5.5 million after agreeing to sell off about a third of the property to Dublin for a roundabout and the rerouting of Riverside Drive for a public park. The developer paid another $4.3 million in August for about 15.1 acres north of Dale Drive. Crawford said the development company has a couple of more smaller parcels to acquire to round out its assemblage. He said the city’s commitment to an urban redevelopment standard attracted the developer.